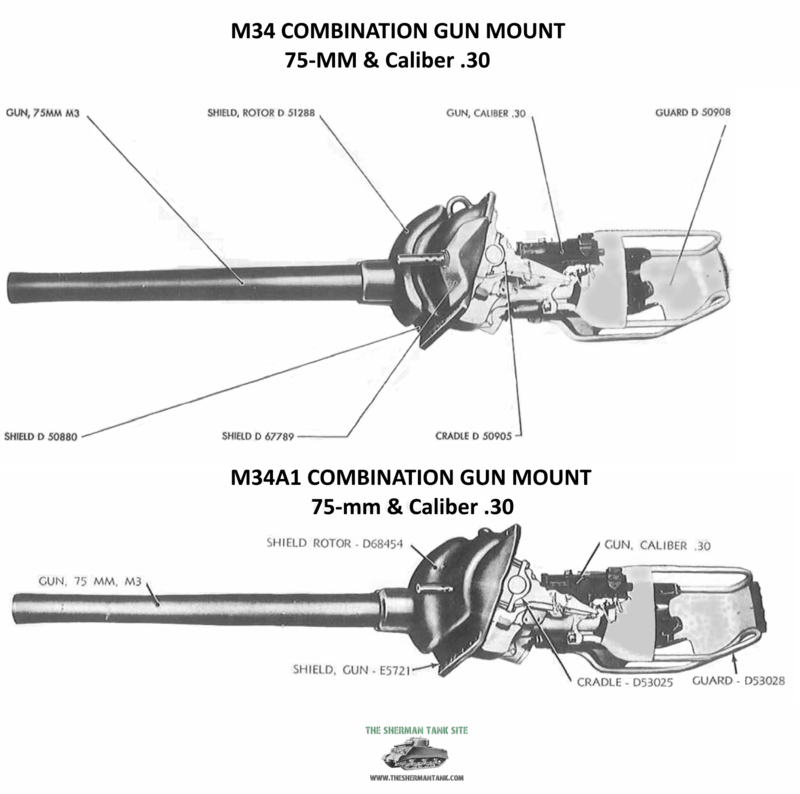 M4 Sherman Tank Small Arms Page: The Machineguns and their mounts, used on the M4 series tanks and vehicles based on its chassis. The US Army issued early Sherman tanks with a single Thompson M1928A1 .45 caliber submachine gun. The tank also had two boxes to hold a total of twelve hand grenades of various types. 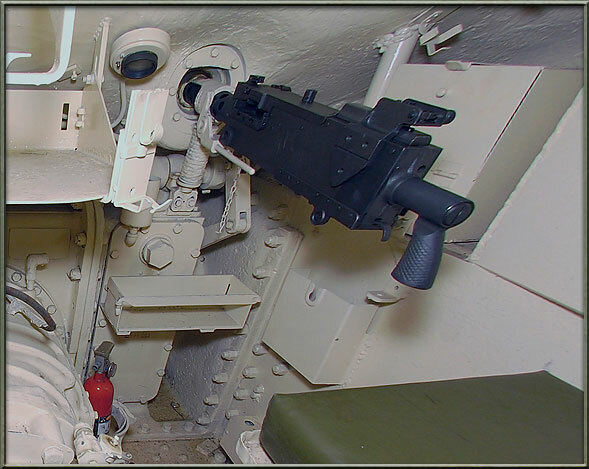 Two smoke and two thermite grenades were kept in a box on the left side turret wall, and there was another box under the gunner seat that held 2 smoke grenades, 4 M2 fragmentation grenades, and 2 M3 offensive grenades. The tank also had a pair of M1919A4 machine guns and the M2 HB that could be mounted on the pair of tripods issued with the tank. They had 600 rounds of .45 ACP and 4750 rounds of .30 caliber, and 300 rounds for the M2 HB. This was what the tank could officially carry, but crews often carried more .30 caliber rounds, and even main gun ammo on the floor of the tank, and they would also store small arms ammo on the outside of the tank. 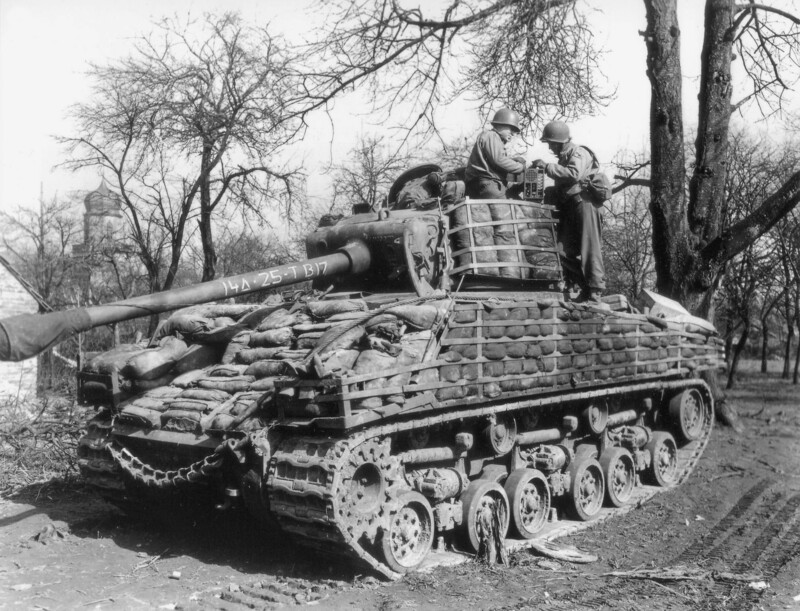 Later versions of the Sherman were issued with a slightly different setup. The single M1928A1 Thompson was replaced with 5, M3 submachine guns. The other major change was, all the machine guns were provided with more ammo, 600 .50, 6250 .30, and the same 600 rounds of .45 for the new SMGs. The tank was also issued with a small number of spare parts that commonly broke on all the weapons and specialized tools to service the tanks weapons and small arms. 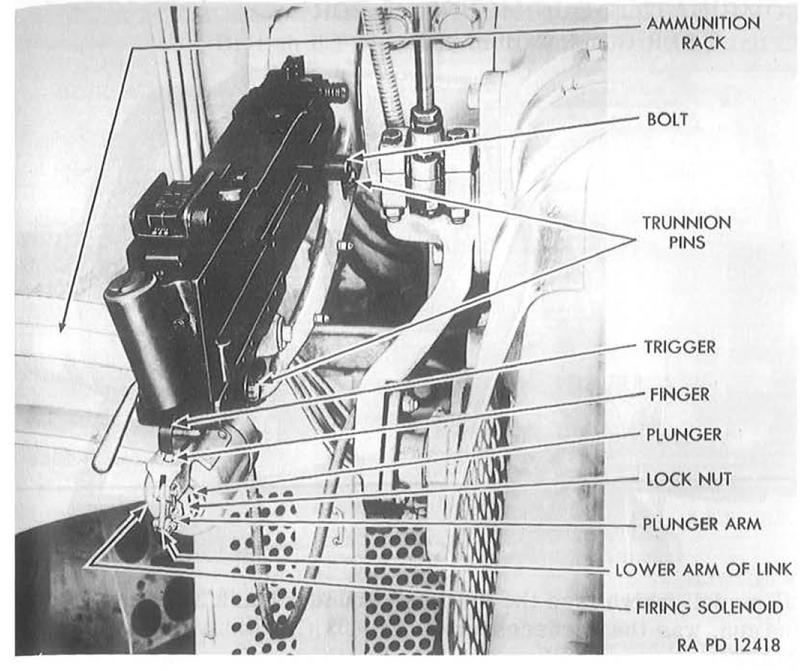 In all cases, each member of the Sherman crew would have been issued an M1911A1 pistol as a sidearm, but that was their personal weapon and not part of the tanks gear. They would also be carrying around any captured small arms they wanted to, MP-38/40 SMGs were probably very popular with the early Sherman crews as 9mm ammo was easy enough to get. This page is also going to cover the actual mounts these weapons went into or on. 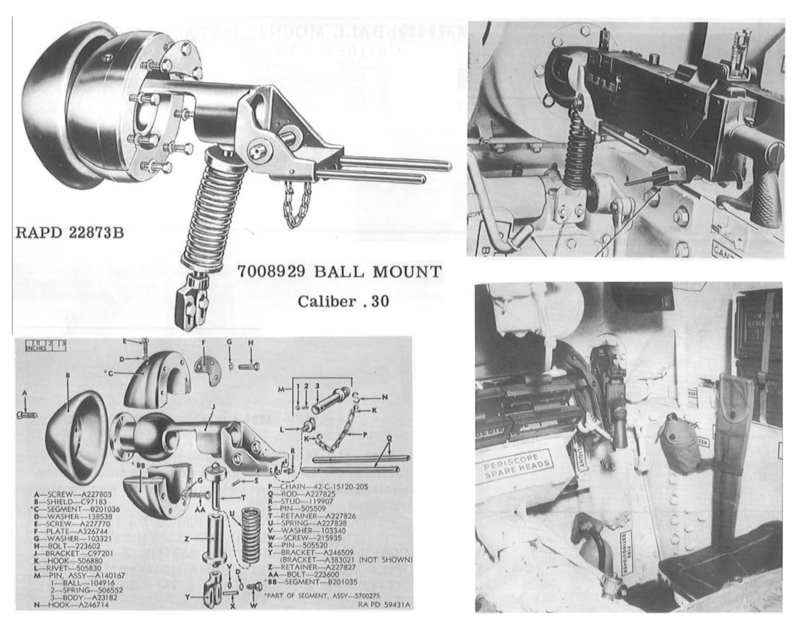 There were several types of Co-axial machine gun mounting brackets, and several kinds of .30 and .50 caliber used on the turret. We also cover the bow mounted ball mount here. 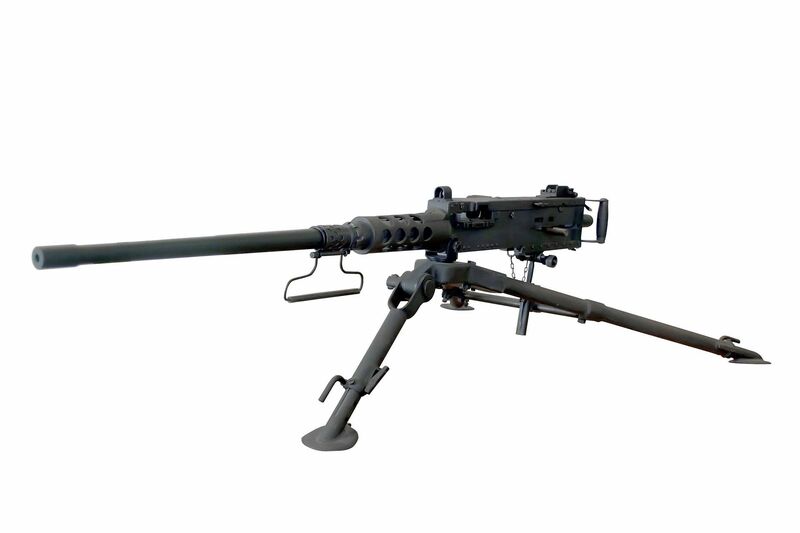 Who doesn’t know about this machine gun, developed before WWII, it was a legend by the end of the war and is still being used. It saw use everywhere the US Military fought. If it could mount a heavy Machine gun or guns, the Americans put one of these on it. The Sherman had one, The M16 halftrack had four, the P-47 Thunderbolt had eight! 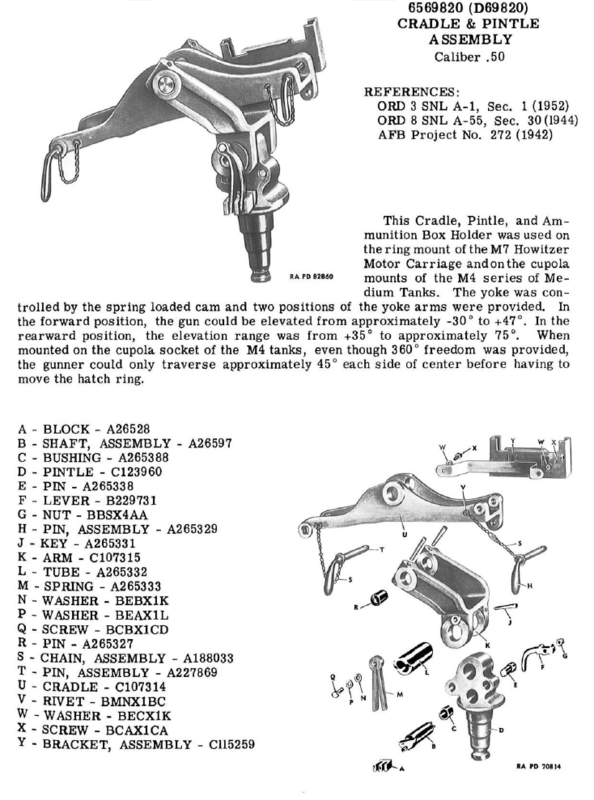 They used them on ships, jeeps, aircraft, with the infantry, and as AA guns. There is a reason this machine gun, designed by maybe the greatest firearms inventor of all time, John Browning, is still in use, its a great gun, firing a pretty good round. It’s so well liked, the slightly improved version still serve with the US Military and to many other Nations around the world to list here. An M2 HB on a tripod, these machine guns were mounted on the turret of all American Shermans. 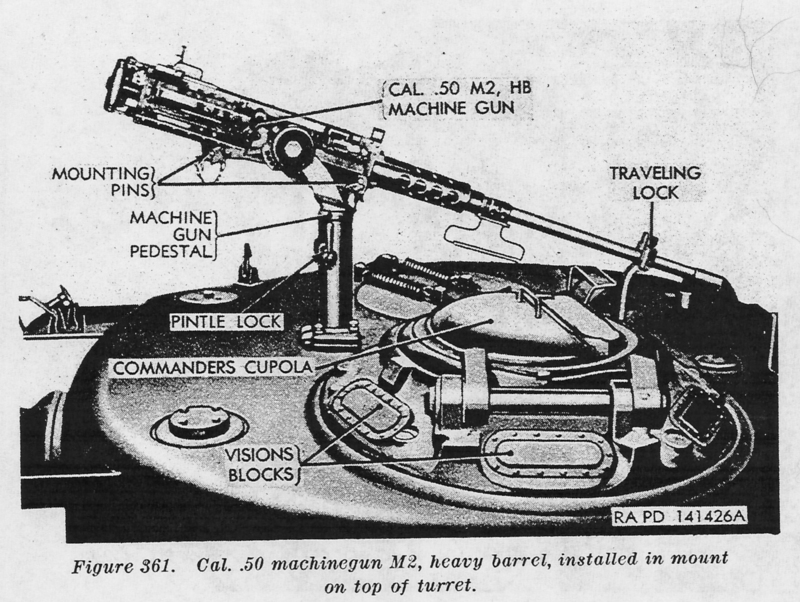 The tripod was stored on the tank when the gun was mounted on the turret roof. There was also a mount for it on the back of the turret for when it was not in use, and the barrel was removed. 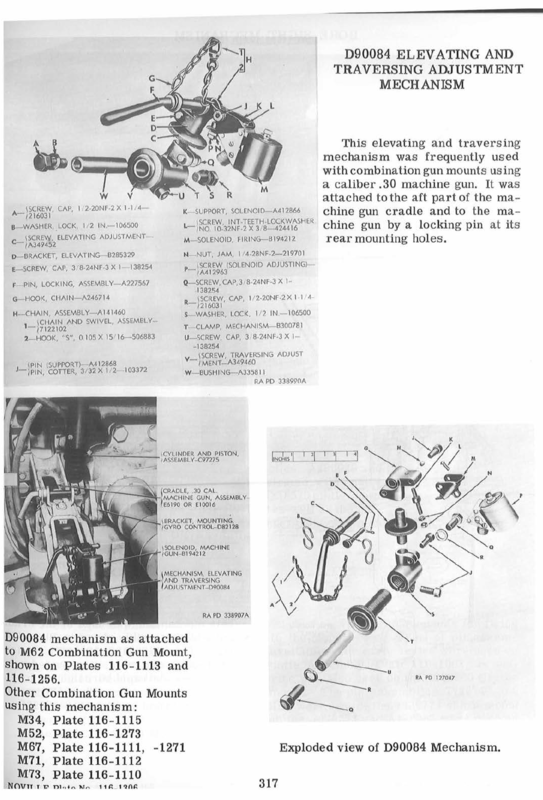 The versions issued on the Sherman had a 450 to 550 RPM, and a quick change barrel that still required it to have its headspace adjusted, so not all that quick. Someone who knew what they were doing could keep the barrel from overheating by firing in short controlled bursts though, and on the Sherman, since the ammo supply was fairly small, you had to use it sparingly anyway. 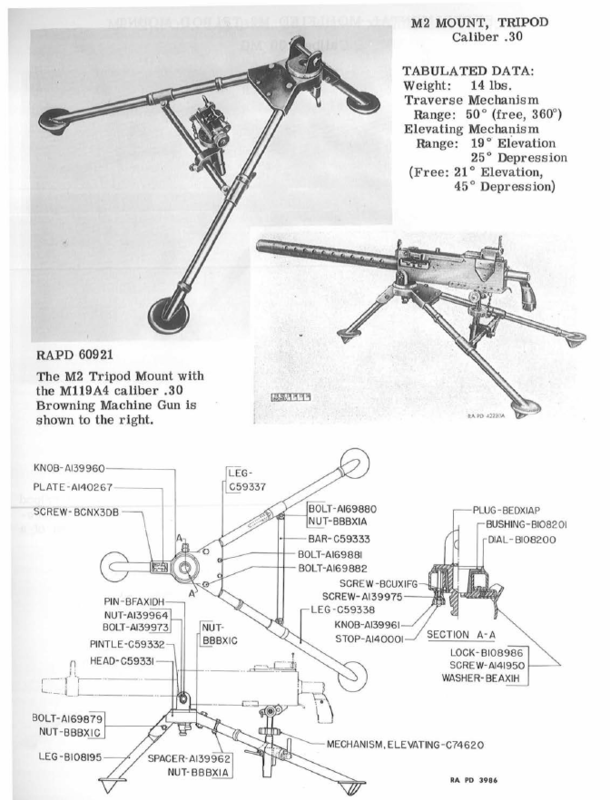 The machine gun would rarely leave the tank, were the lighter M1919s might be pulled and mounted on a tripod for some reason, if the crew had to fight on foot, or to set up around a perimeter at night maybe. In the Pacific, they would build a bunker under the tank and have a sandbagged enclosure at the front they could crawl into with the .30 mounted on a tripod. 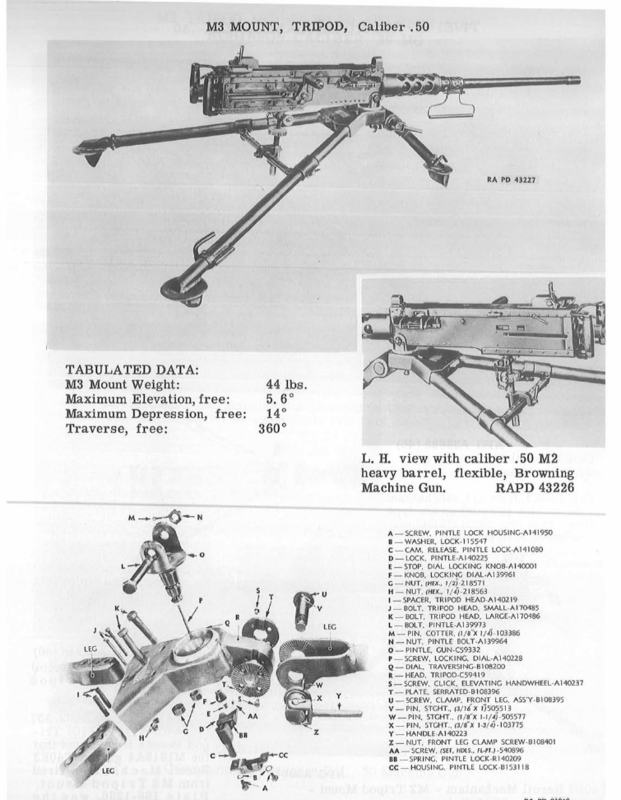 M1919A4 .30 caliber machine gun: It if was a US unit, or vehicle, with a .30 caliber gun, it was this gun or an earlier variant. An M1919A4 on a Tripod, the M4 Sherman tanks had between 2 and 3 of this machine gun, but only one tripod for it. The Sherman crew was provided with two, sometimes three of these guns. They like their bigger, little brother, the M2, was designed by John Browning. For The US Military in WWII and Korea, .30 caliber meant the 30-06 cartridge. This was a pretty decent round as .30 caliber rounds go and would serve as the Army rifle and light/medium machine gun chambering until the adoption of the 7.62 NATO round. 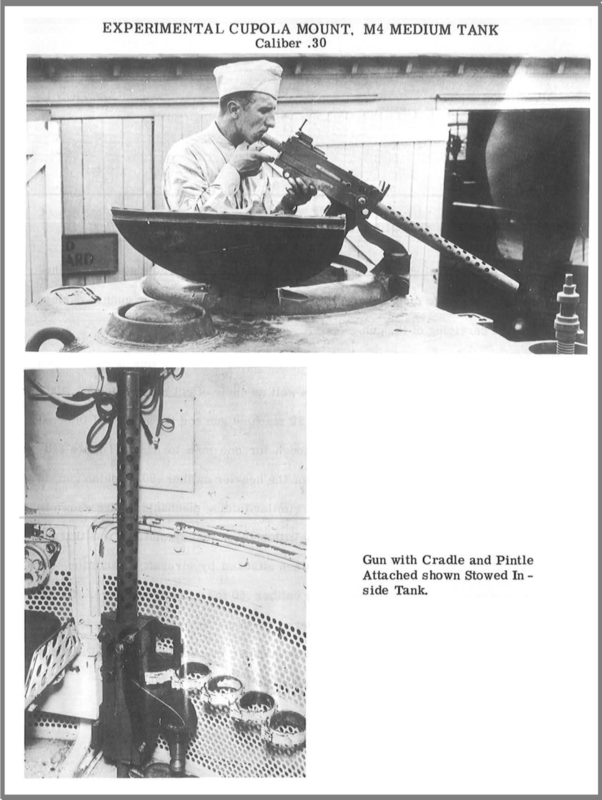 This gun spat rounds at between 450 and 550 round per minute and it was a reliable and well-liked gun. 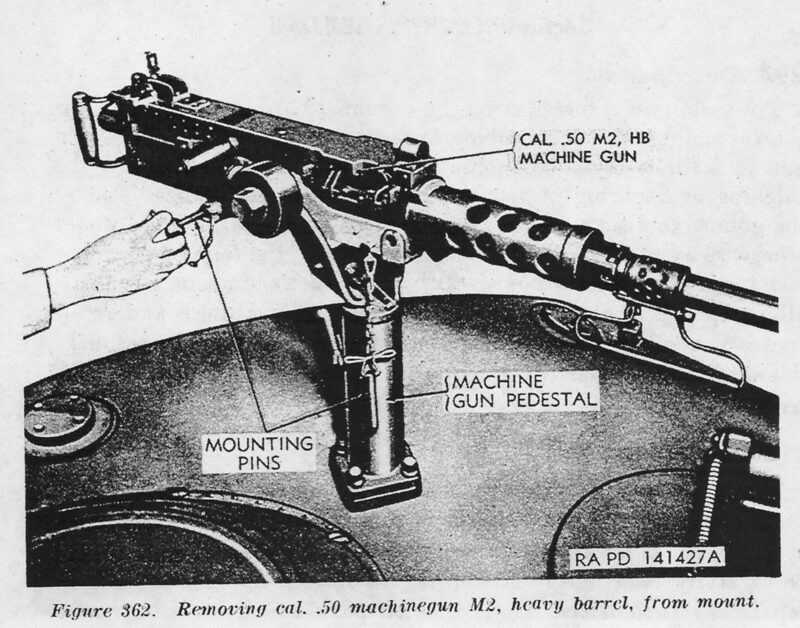 If it had a flaw, it was it was not easy to swap barrels on, for the same reasons as the M2, and it was a tad heavy for a light/medium machine gun, these are minor flaws for a vehicle mounted MG, though, in longer fights, the co-ax M1919 would burn out their barrels before the fighting was over. 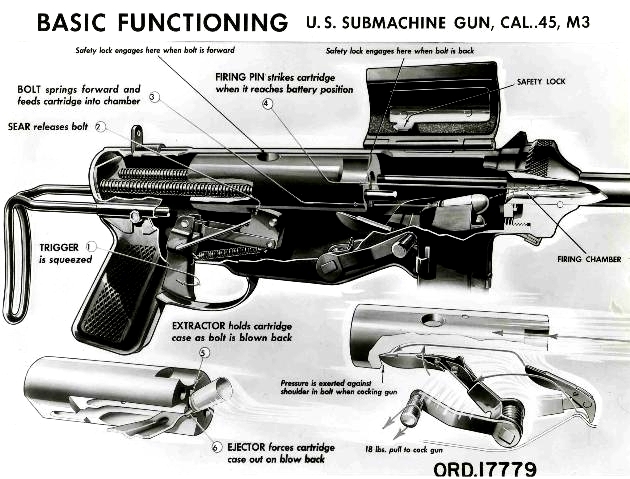 The M1919 served with the US Army, and Marine Corps well into the 50s, they were eventually replaced by the M60 machine gun. 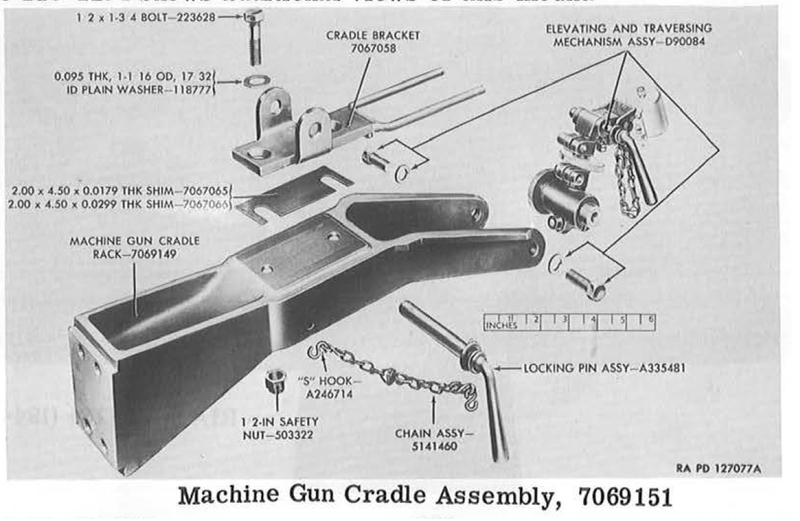 These machine guns have a long and well-recorded history, and my goal here is to talk about them without causing any new myths or bad information. 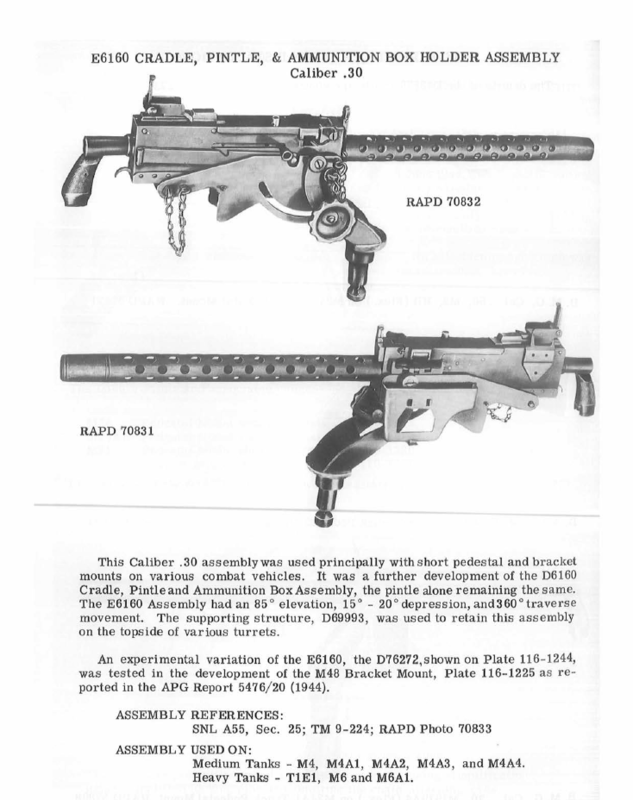 Now let’s talk about the Submachine guns. 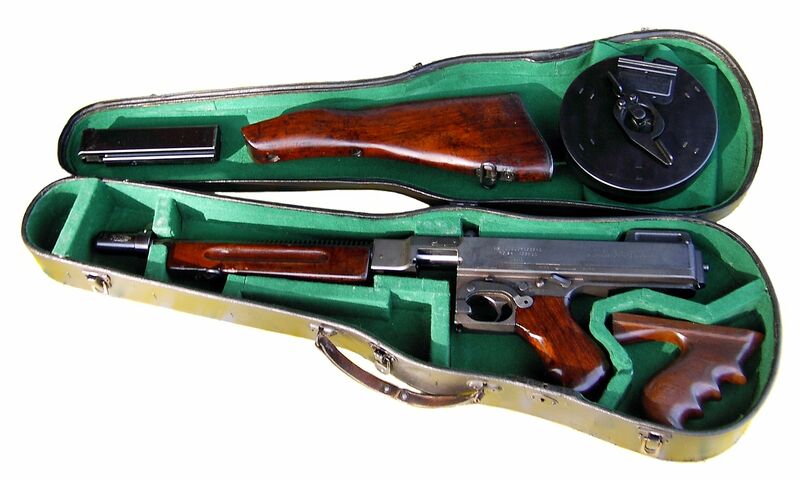 A Thompson in a Violin case. Was this a factory option? This SMG is another American Classic, and it was a classic by WWII all on its own. Originally developed for use in WWI, it missed the war, and any Military contracts, but the gun was sold on the civilian market. Enough sales trickled in from a few small government and police agencies, along with foreign sales to keep Auto-Ordnance alive between wars. The weapon was sensationalized by the media after it was used by prohibition-era gangsters and a few notable regular criminals, and this inspired some of the nation’s first federal gun control laws. In 1934 the National Firearms Act went into effect after being passed by Congress. It limited the sale of Machine guns to civilians and made the ones already in Civilian hands have to be licensed. There was already one huge limiting factor on Thompson sales if you were not a government agency; you had to be pretty rich to buy one. Sure, a few criminals were, but what normal Joe of the 1920s could spend $200 bucks on a machine gun when a new car cost around $400? That 200 bucks was for the basic 1921 m model with 1 magazine. When you started adding things like the wood front pistol grip, deluxe wood furniture and drum magazines and fancy cases, the price could run into luxury car range. The M1928A1 was not all the different from the M1921, and still used the odd Blish lock and could still take the drum magazines but had dispensed with the front pistol grip. If it had a drawback it was that it was large and heavy for an SMG, but you would think this would help control it. The Army would go on to have an even simpler version of this SMG produced, but as far as I know, only the M1928A1 was issued with early to mid production Sherman tanks. 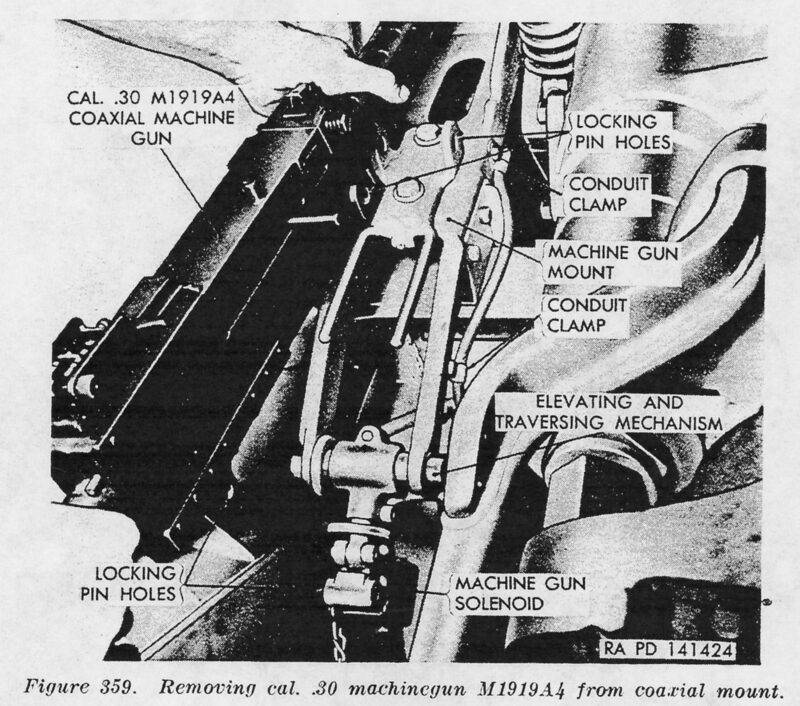 M3A1, not the bigger dust cover, and thumb hole in the bolt. This SMG was designed to be the easiest to manufacture and cheapest SMG that could still perform as well as the M1928A1 and the M3 was born. 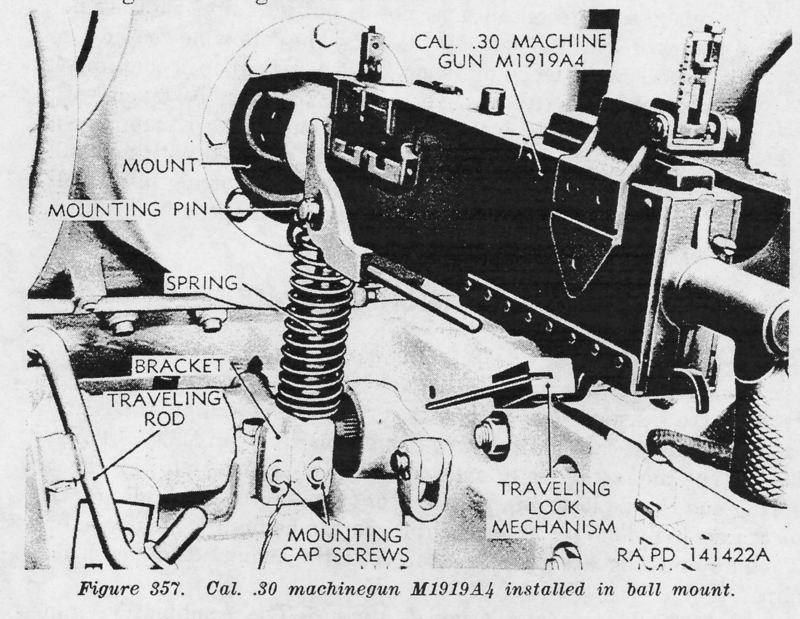 After some use, the M3A1 came about to solve all the problems with the basic M3. The M3 looks a little like a grease gun, so that name stuck, and the weapon would go on to serve into the 1990s as tank crewmen’s weapon. 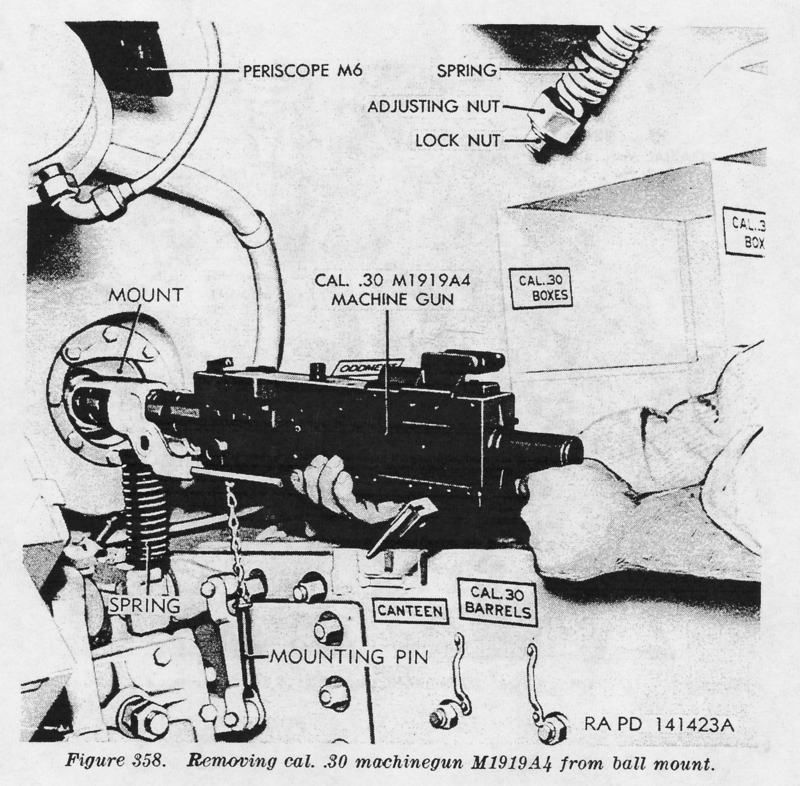 The M3A1 was a simple no-nonsense weapon that filled the tank crewmen dismounted weapon role fairly well, and that’s why it no one bothered to replace the thing. It was replaced with the MP5. From the Sherman crewman perspective, I bet they’d say, five M3A1s is better than one M1928A1. Next up, let’s talk about the pistol. So much has been said about the 1911, I’m not going to say much, but I’ll note for those who don’t know, John Browning designed it too. I will say this, it is not the finest handgun ever produced, nor is it even close to the worst. It is probably the most popular handgun in America, and I own two. 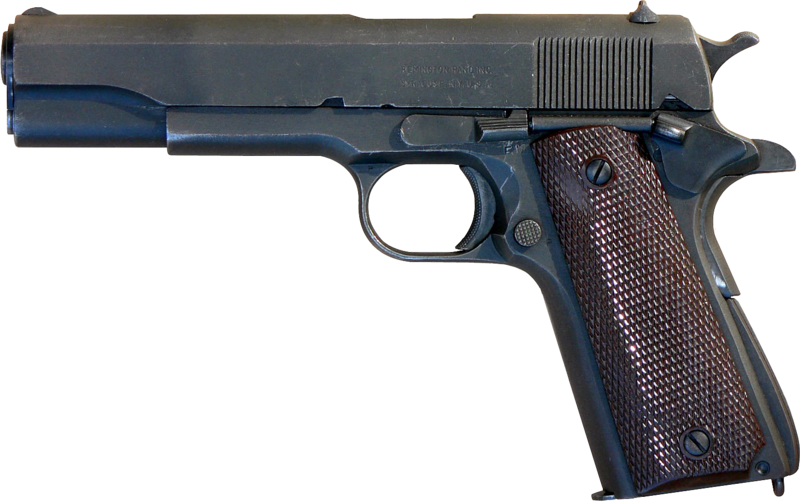 What it was, was a reliable, tested, accurate enough handgun for soldiers, pilots, officers or anyone else who needed one. 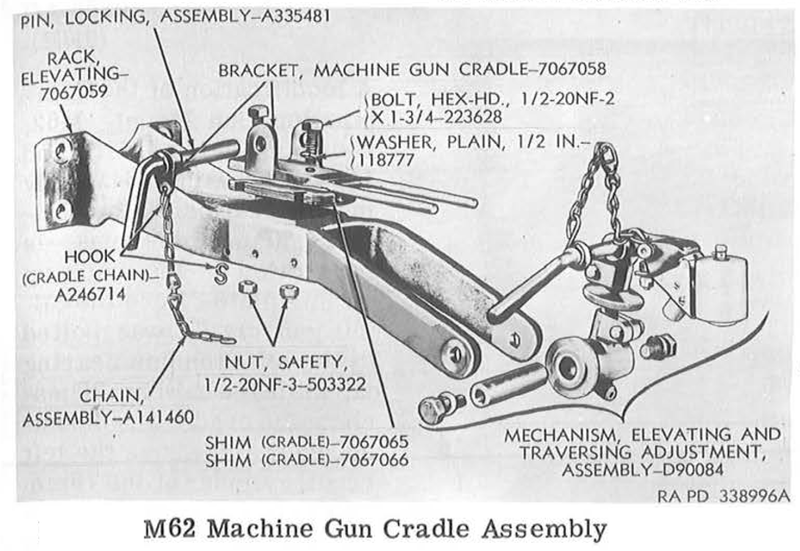 Like all handguns, it should be viewed as a last resort, and the M3A1 or M1928A1 would be more useful in all but the most close of encounters for a tank crewman. It also may be the most written about firearm ever as well, since every issue of Guns&Ammo, Guns, Shooting, etc. had at least two stories about some variant of the gun. I would be surprised if it isn’t the most popular handgun type in the United States. The only guns that seem to rival it are made by Glock. 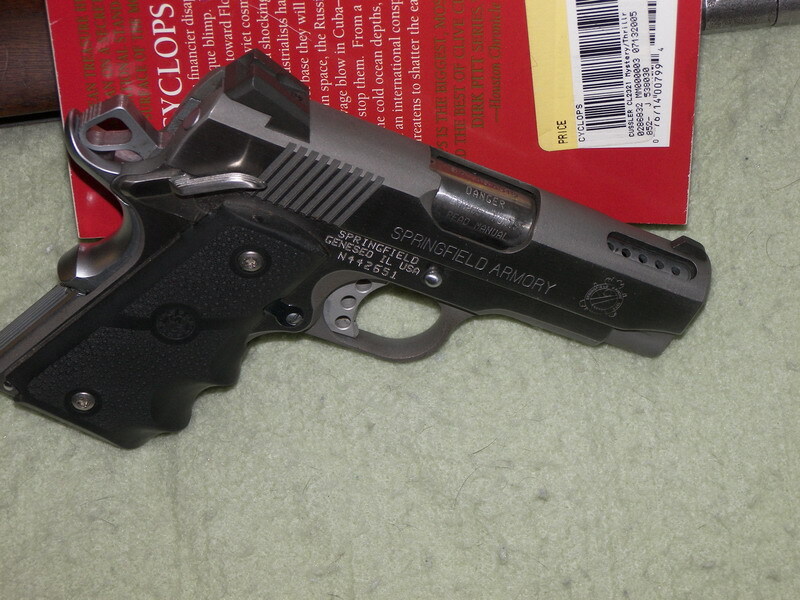 Modern shortened Springfield Armory M1911 copy. Now so far, we’ve only been talking about the weaponry issued with the tank or to the crew. Soldiers and marines being soldiers and marines meant as soon as they were out of an environment where the tank was being inspected on a regular basis they would have started acquiring extra things for the tank. Crews of early Shermans probably worked pretty hard to get more Thompson SMGs, or used captured German or ones; the MP-40 with its folding stock was nice for tank use. I’m sure they stuffed extra grenades all over the tank along with extra .30 cal and .50 cal ammo. 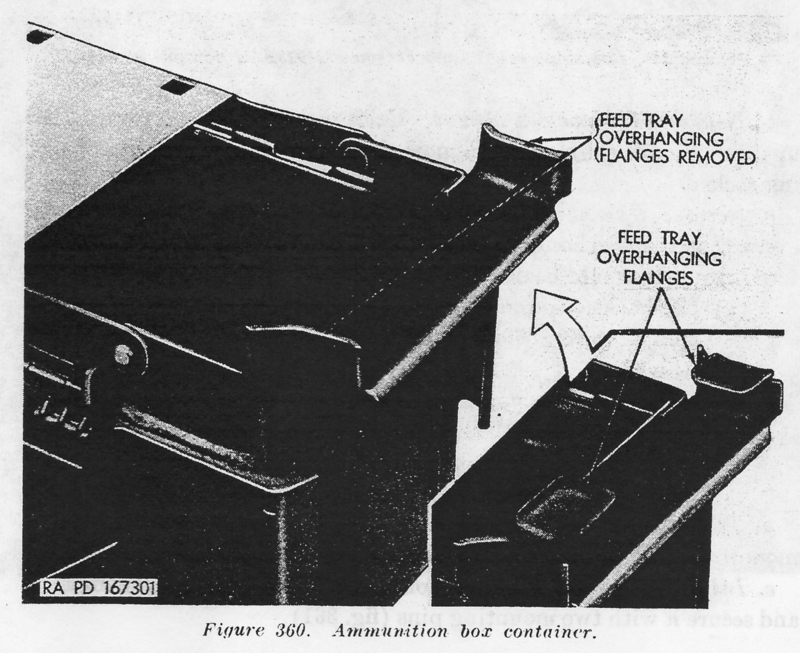 Depending on unit discipline and how aware they were of the risk, some crews might have carried extra main gun ammunition as well, but unprotected main gun rounds were very dangerous to the crew. It wouldn’t be impossible for something like an M1 Garand or M1 Carbine to make an appearance as well. 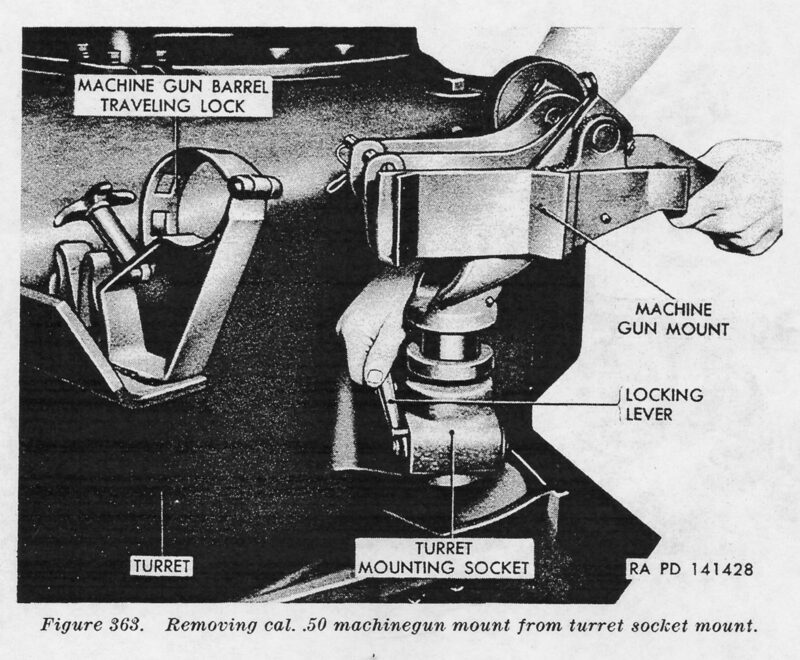 Mounting extra machine guns on the turret for the loader was a fairly popular modification as well.